When Queer Eye premiered on Netflix in February, it had some key differences from its predecessor: a more diverse Fab Five, for one, and a shorter title, for two. But dropping “for the Straight Guy” from the title was purposeful. In Season 1, Bobby Berk, Karamo Brown, Tan France, Antoni Porowski and Jonathan Van Ness also gave a “make better” (because they say they don’t give makeovers, just “make betters”) to a gay man named AJ. Now that the series is back for a second season, it’s focusing even more on inclusivity. Netflix announced that Queer Eye will return for its second season on June 15, which falls right in the middle of Pride Month. Perfect! Even better, the streaming giant announced that the new season will feature Queer Eye’s first female hero (their name for the people they make better) and its first transgender hero. This is a really cool step forward for the series, and we’re excited about it! According to Entertainment Weekly, the first Season 2 episode features Tammye, the series’ first female hero. Tammye is a schoolteacher and cancer survivor who’s planning her church’s homecoming. Apparently, we need to have tissues at the ready — this season already sounds like just as much an emotional roller coaster as Season 1. However, Berk’s Fab Five cohorts saw this as an opportunity for education and growth. Fashion expert Tan France said that he, Brown and Berk had a “really heated” conversation during filming and that he and Brown ultimately sought to show Berk that “people turned their back” on him, and that Tammye wasn’t one of those people. “There are times even we need to educate each other. … It’s not just the audience we like to impact, it’s each other,” France said. Berk praised Tammye for being “so loving and accepting and open,” and just reading these quotes is already making us teary-eyed. France agreed, adding, “I think that LGBTQ people are lumped into a group, and many people assume that I’m in the struggle with everybody else in my group,” but that’s not often the case. He admitted to not being as prepared for Skyler’s episode as he was for others, but that he hopes they did the episode respectfully and appropriately. 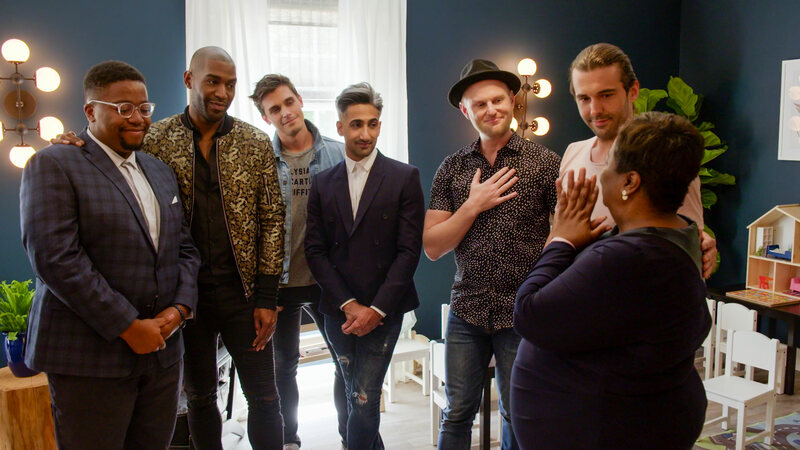 Featuring heroes that are more diverse is such a great step for Queer Eye as the series continues to receive praise from fans all over the world. We cried our eyes out watching the Fab Five transform lives in Season 1 — and kept following subjects’ stories, like Tom and Abby, a divorced couple who reunited on the series and then got married again in May — and we can’t wait to do it all over again.